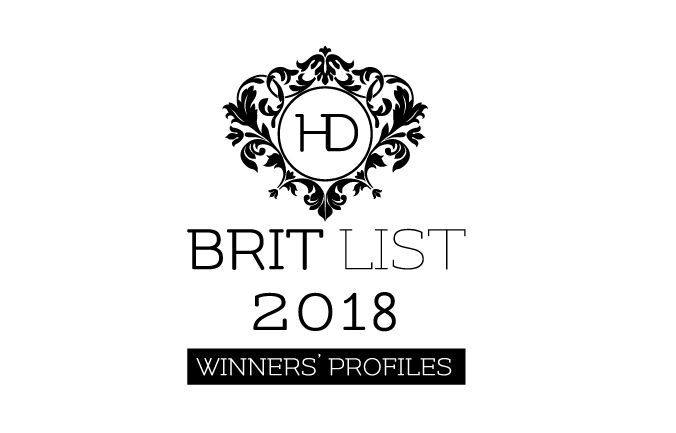 Working to a Martin Brudnizki Design Studio design, lighting specialists Dernier & Hamlyn produced a stunning two-tier chandelier almost 1.5 m across that forms a focal point in Brasserie Prince by Alain Roux. 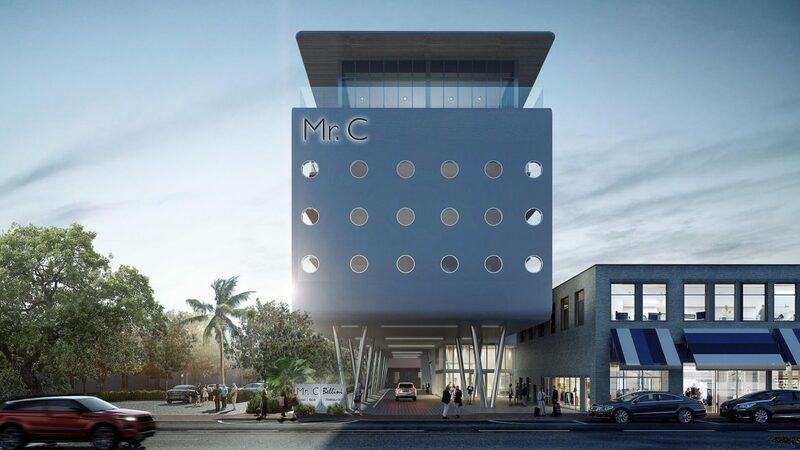 When it comes to designing a hotel that not only stands the test of time but also creates an awe-inspiring impression from check in to check out, two heads really are better than one and collaboration is most definitely king. The most recent example of this can be found in Cambridge, in the new 192-room hotel Universtiy Arms. 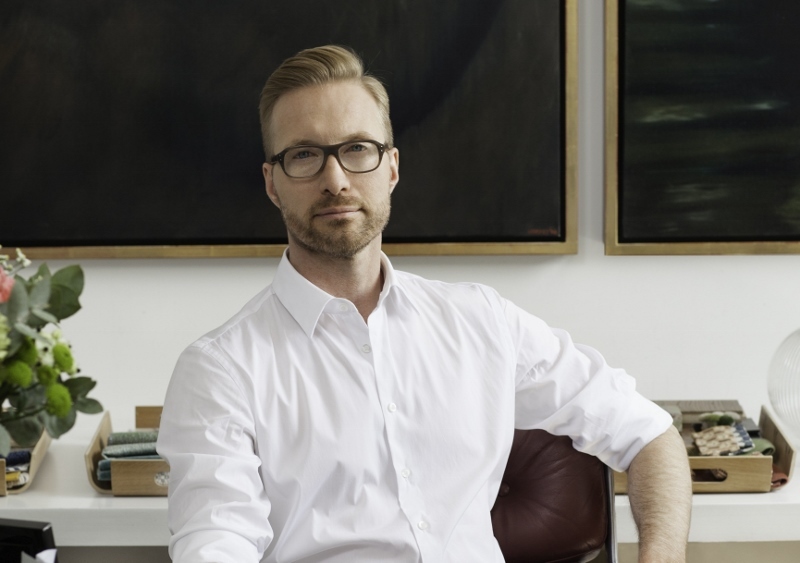 The creative footprints of two celebrated visionaries’ – architect John Simpson and interior designer Martin Brudnizki – are very much in the fabrics as it heads towards opening. 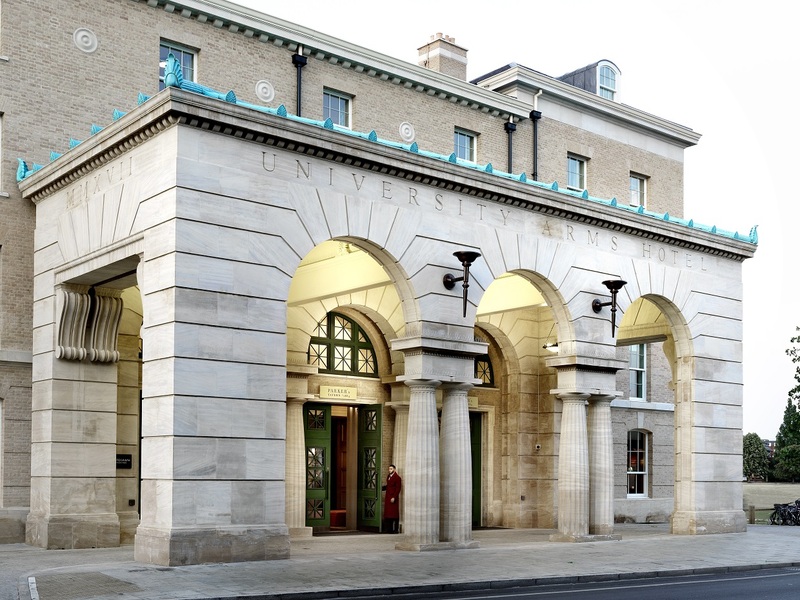 Slated to be one of 2018’s most exciting hotel unveilings, University Arms, Cambridge is expected to open on August 1. 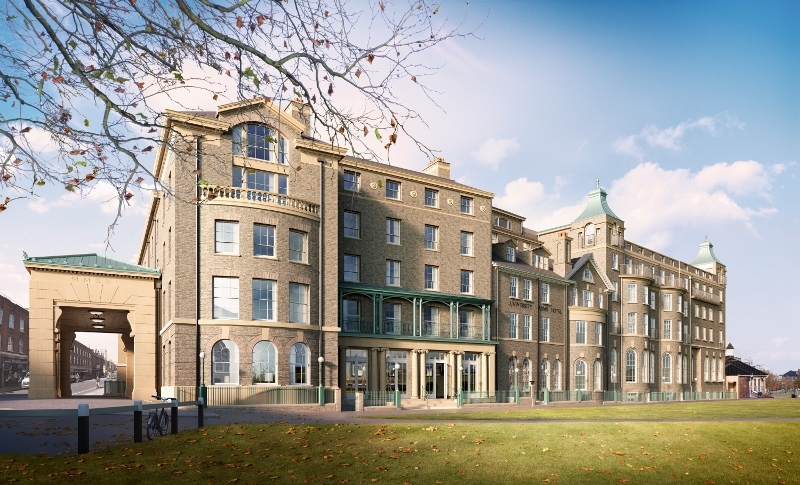 The landmark hotel is located overlooking Cambridge’s Parker’s Piece. 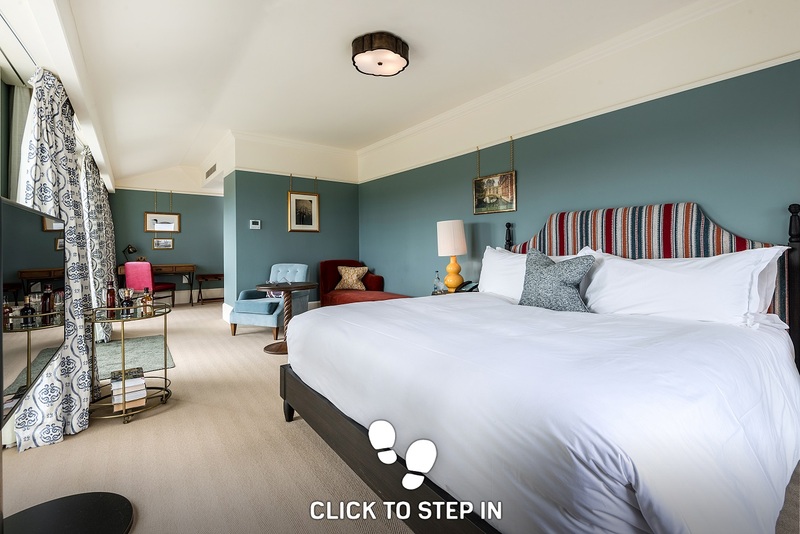 First opened in 1834 as the city’s original hotel, its currently undergoing an £80m transformation. 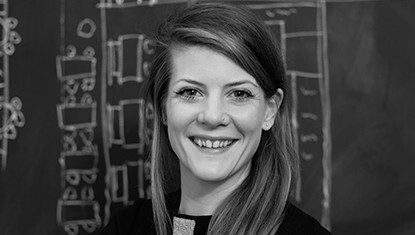 Simpson is one the nation’s foremost classical architect and has worked on extensive projects in Cambridge, including at Peterhouse and Gonville and Caius Colleges.The architect whose portfolio also includes working on both Buckingham and Kensington Palaces has overseen the hotel redevelopment. 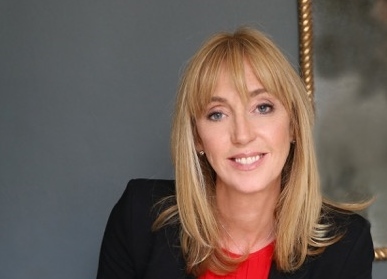 This includes the replacement of the building’s 1960s and ‘70s extensions with an attractive, classically designed front that is in-keeping with Cambridge’s better-known architectural heritage. 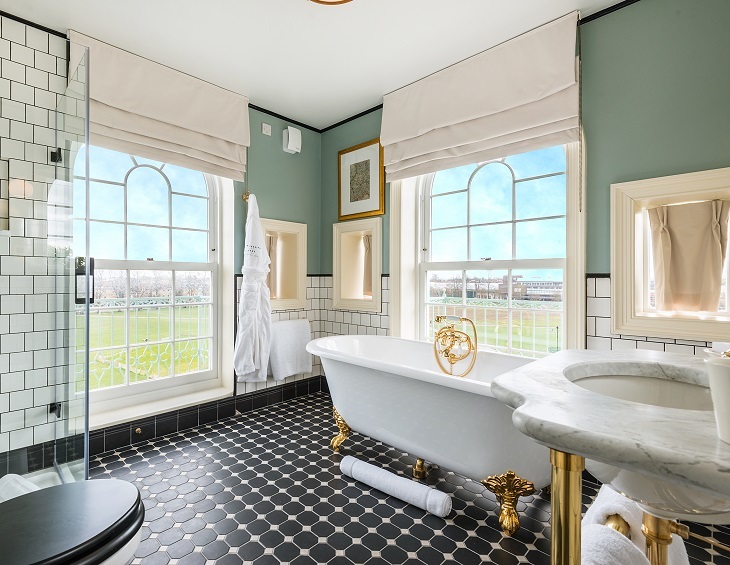 He approached the project with a self-professed vision to “try and create this hotel so it becomes the best hotel in Cambridge again”, restoring its faded glory. 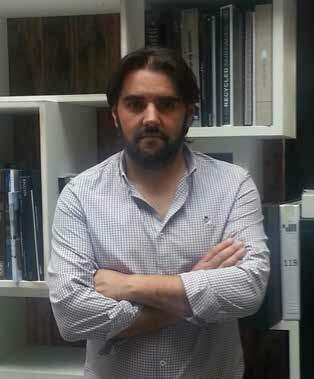 Brudnizki’s past projects include Miami Soho Beach House, Scott’s, The Ivy and the acclaimed Beekman in New York. 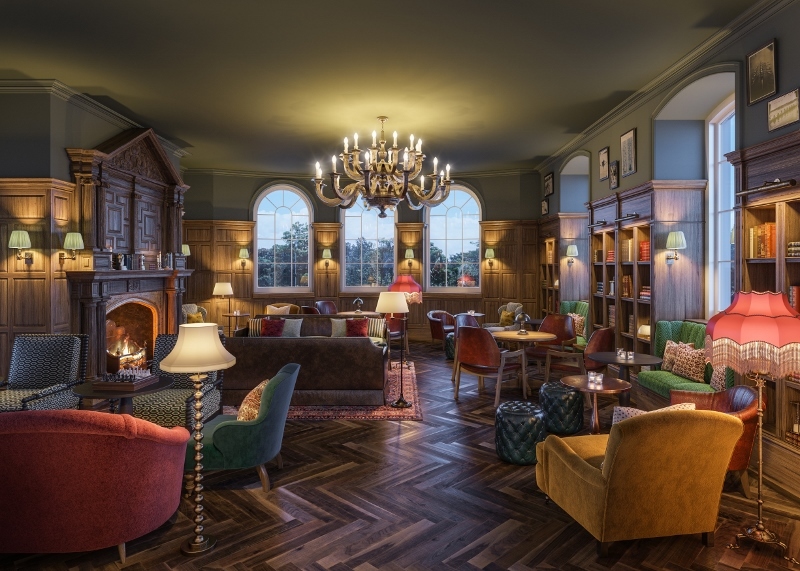 University Arms is the first complete hotel project in the UK that will showcase the designer’s interiors from top to bottom. Throughout the planning process, Brudnizki has been mindful to create an environment reminiscent of school days past, lazy afternoons spent on the banks of the River Cam and the raucous revelry of students; truly a space for locals, tourists, Cambridge students and their families alike. Creating a timeless look and feel, Brudnizki chose a selection of bespoke products from Chelsom to light up the public areas and guestrooms. 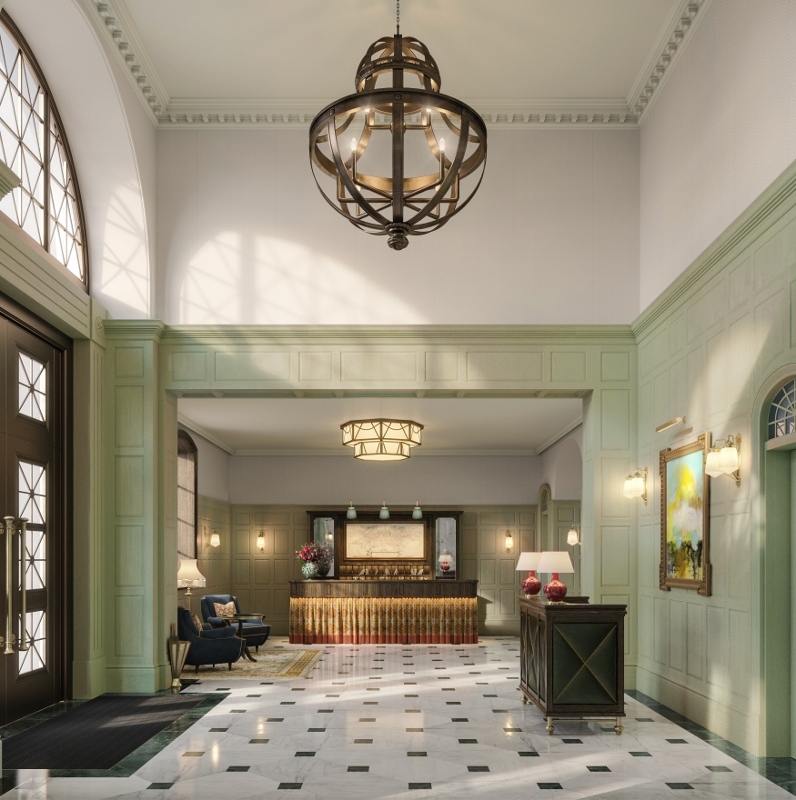 Providing a warm welcome for guests, the lobby boast a grand, high ceiling, Cambridge Blue timber panelling and a grey and green patterned marble floor. Natural light pours in through large glass windows, while statement art deco lighting lends a glowing touch. 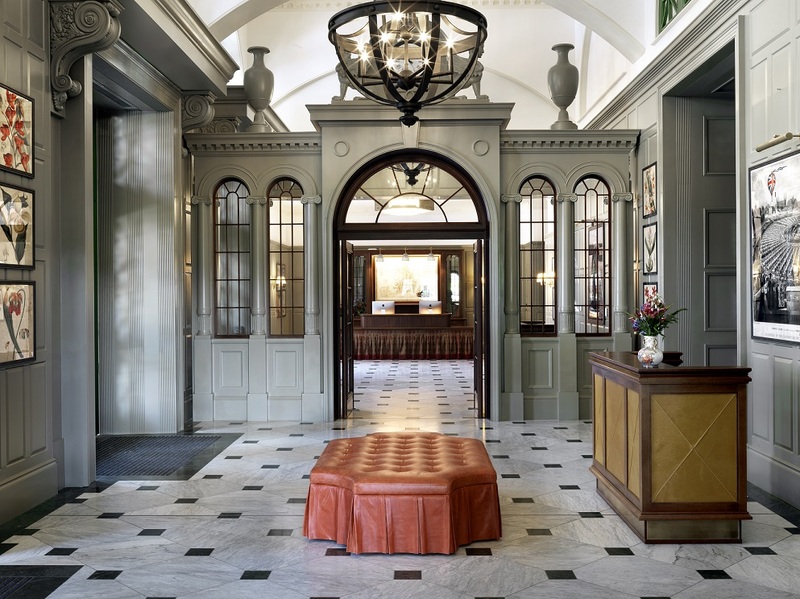 An unimposing, fabric-fronted reception desk adorned with a mixture of bespoke and antique furniture ensures that guests feel at home from the moment they arrive. Paying homage to its famous location, the hotel’s library is an area for relaxation and escape. 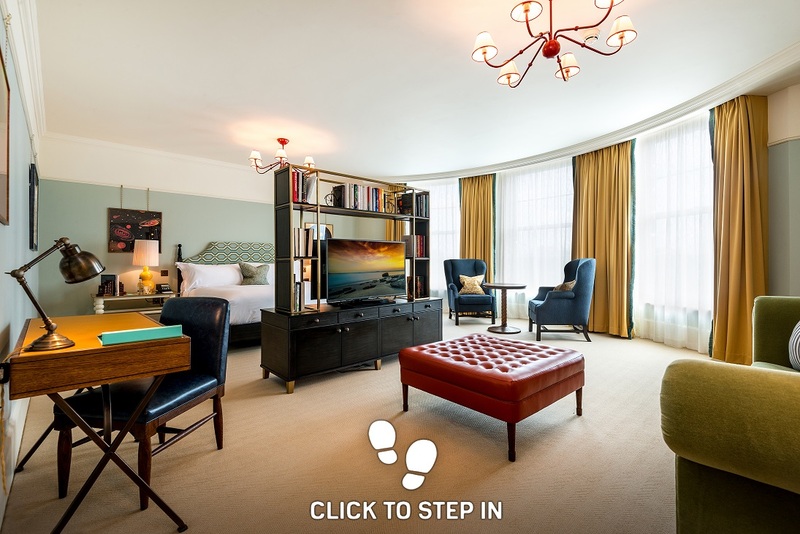 Curated by Heywood Hill – one of the leading bookshops in London – the room is filled with books from renowned authors, which many of the suites are named after. Bookshelf walls, traditional timber panelling and an original, wood-burning fireplace create a home-from-home with a luxury spin with an eclectic mix of deep sofas and cosy armchairs ensuring optimum comfort. 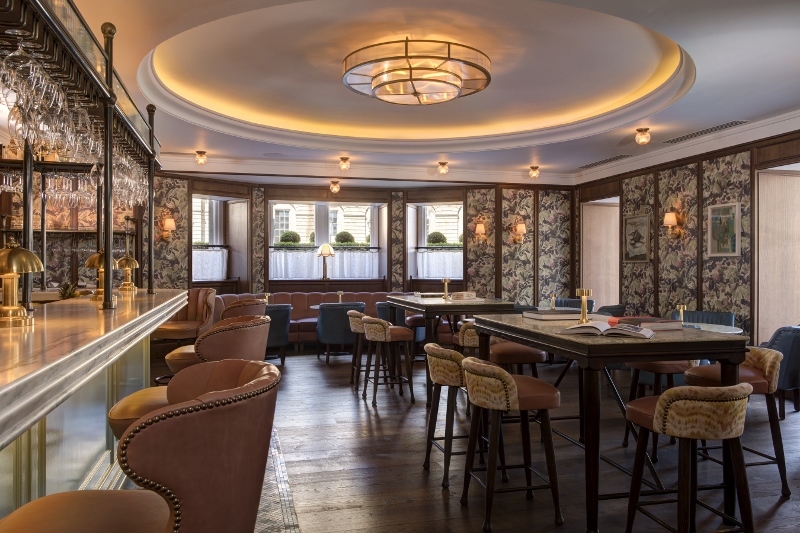 The library flows through to the bar, featuring bold marble patterned wallpaper. Reminiscent of antique book covers, the design flourish reflects the city’s heritage as an academic institution. A dark wooden bar forms the backdrop for a diverse range of seating and tables. Traditional loose rugs paired with statement lighting and classic bead ceiling creates a welcome atmosphere for both guests and visitors. Inspired by the communal dining halls of Cambridge College, Parker’s Tavern will be the standalone restaurant of the hotel. 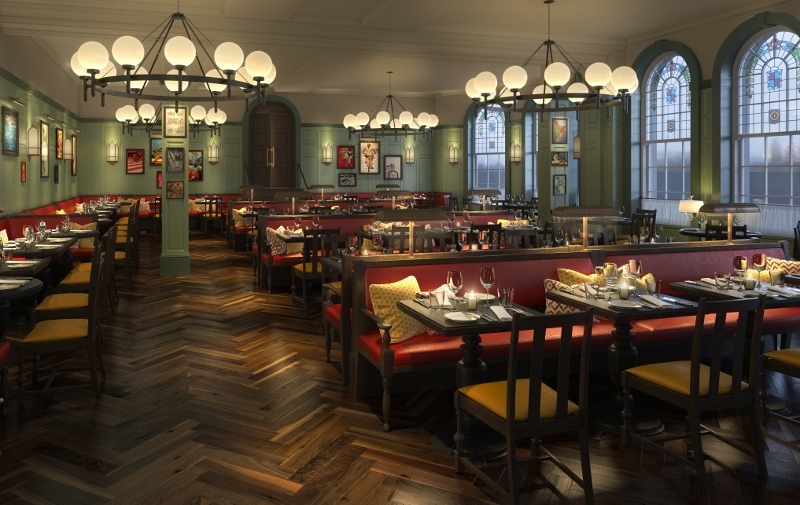 It will offer canteen-styled seating with a mix of free-standing dining chairs and benches, all finished in red and mustard-yellow leather and dark timber. 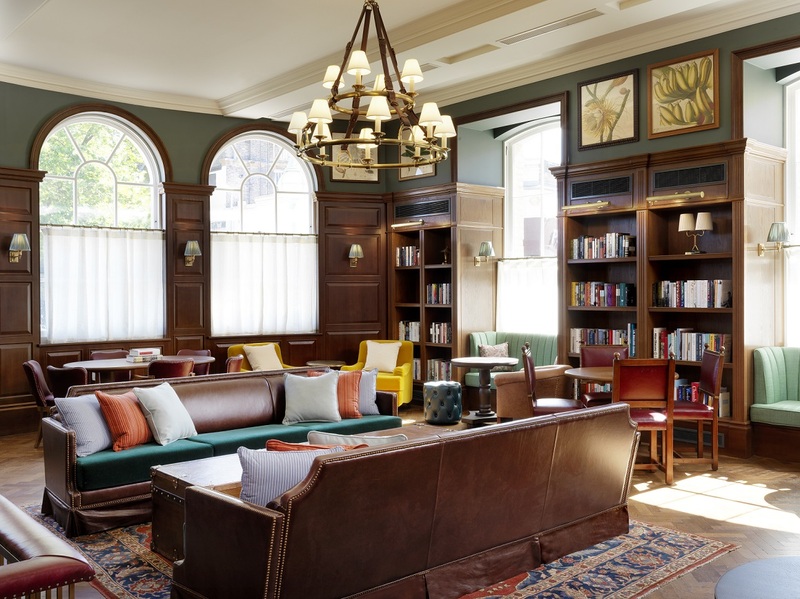 The Cambridge Blue wall panelling, traditional solid-wood parquet following and original stained-glass windows with crest detailing are reminiscent of the traditional architecture of the city’s university colleges. 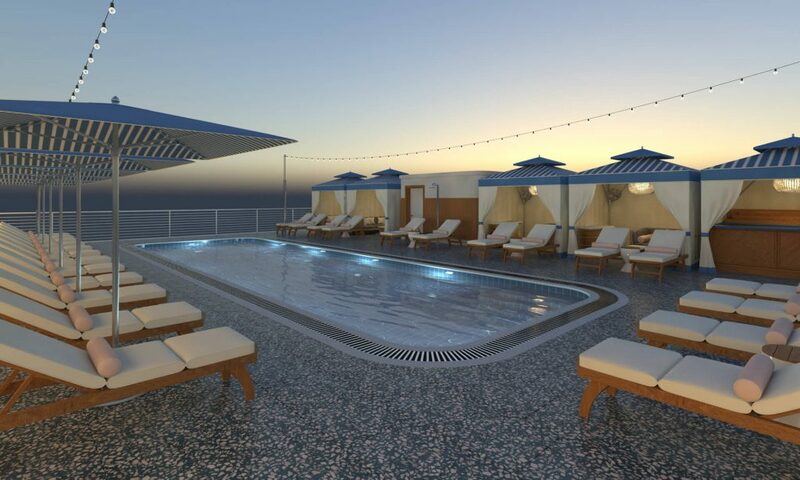 The guestrooms and suites will open with a light, breezy and relaxed feel. Hints of Cambridge Blue, yellow and red enliven each space, while some are paired with a traditional bookcase divider with private library, again curated by Heywood Hill. 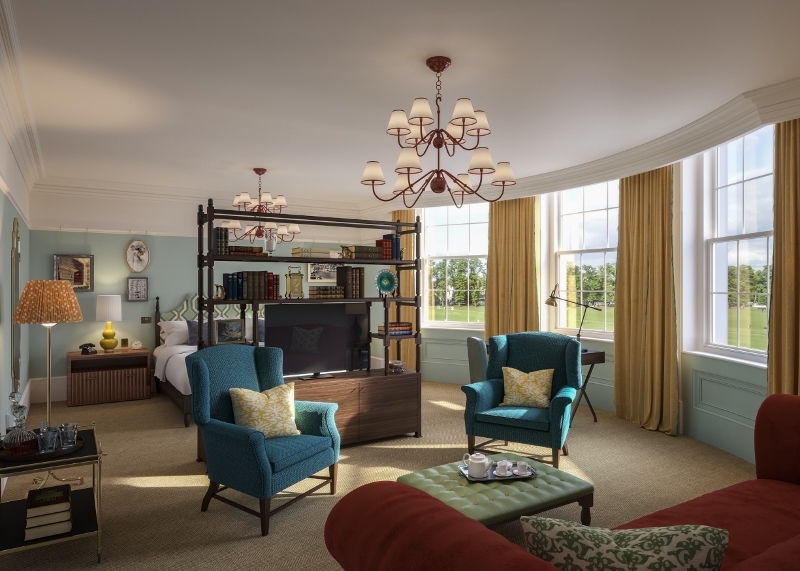 All rooms come complete with bespoke furniture and statement chandelier lighting from Chelsom. 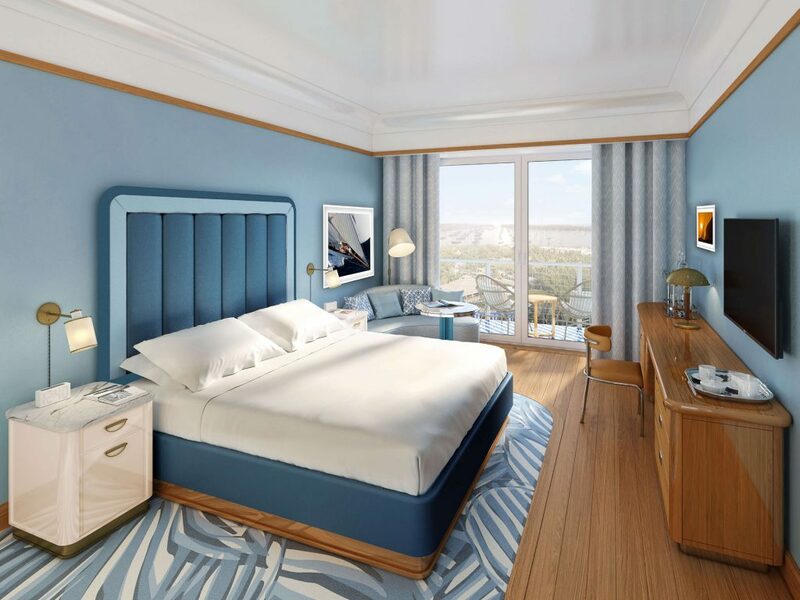 As the hotel nears completion, the work of two leading names in our industry can stand back to reflect on what can happen when a successful collaboration comes together.